Elegant Pianowood Photo Plaque with Gold or Silver frame, acrylic cover and metal plate. Perfect for individual or team photo events. 8"x 10" plaque size for your 4" x 6" photo. Vertical or Horizontal plaque orientation to accommodate your vertical or horizontal photo. Professional Photo Developing included, just upload or email your photos. Also available in a 9"x 12" plaque size for your 5" x 7" photo. This Photo Plaque - Photo 4" x 6" Rosewood RP-FP10BBS is part of our Photo Plaque Series of products, check out other products & options available in the Photo Plaque Series of our selection. 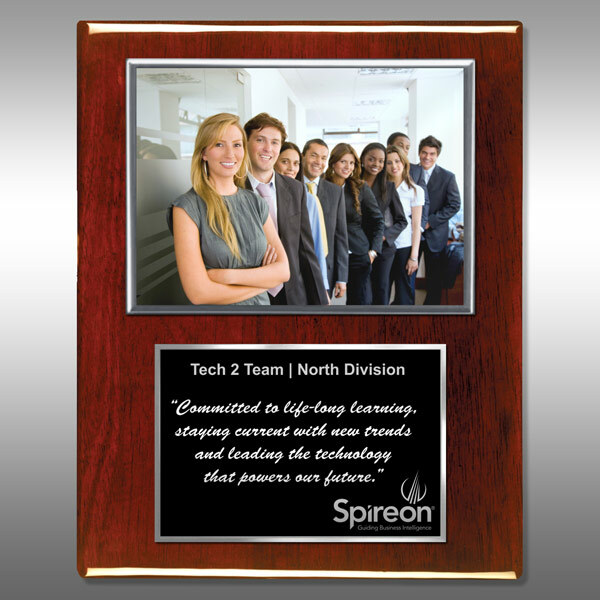 This Photo Plaque - Photo 4" x 6" Rosewood RP-FP10BBS can be modified to your requirements and is available for your corporate award programs.